Hello Friends and Happy Monday!! Hope you all had a great spring weekend! I wanted to let you know I’m up on the Trinity Stamps Blog with all the details on these fun birthday cards. I mixed and matched several stamps sets to create this cheerful card set. Hope you can stop by the blog for all the details. I’m up on the Trinity Stamps blog and my daughter is joining me for our Monthly Stamping Together Series. She sketched an idea and we had fun getting messy creating these bright and cheerful watercolor cards. I hope you can stop by the Trinity Stamps blog for all the fun details and the kiddo has a little post of her own. Way too cute! Hello Friends and Happy Monday! I’m up on the Trinity Stamps Blog for this month’s One Stamp, Three Ways post. For April, I’m showcasing the Coffee Character Stamp Set. This stamp set is HUGE and there are so many images to play with. I thought it would be fun to play with the coffee and tea images and pair them up with the cutest little hearts in the set. I hope you can stop by the Trinity Stamps Blog to see all the details. Welcome to April my friends and Happy Monday. 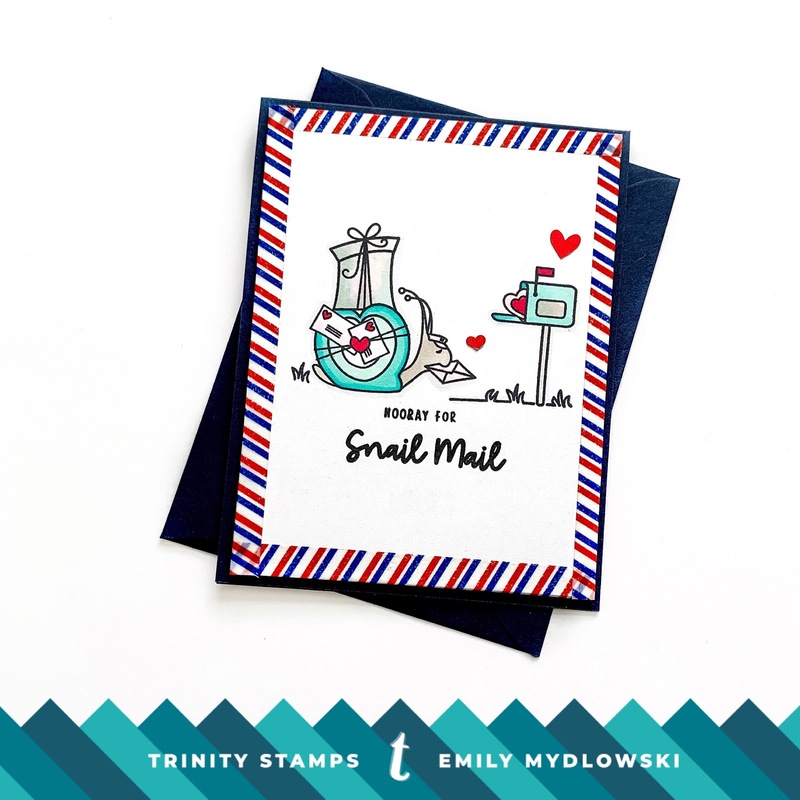 I’m up on the Trinity Stamps blog featuring this cute Mr. Snailman stamp card and decorated envelope and liner to create a fun set to celebrate those times when you just want to send a little happy mail. Hope you can join me over at Trinity Stamps for all the project details. Hello Friends, I hope you had a great weekend! 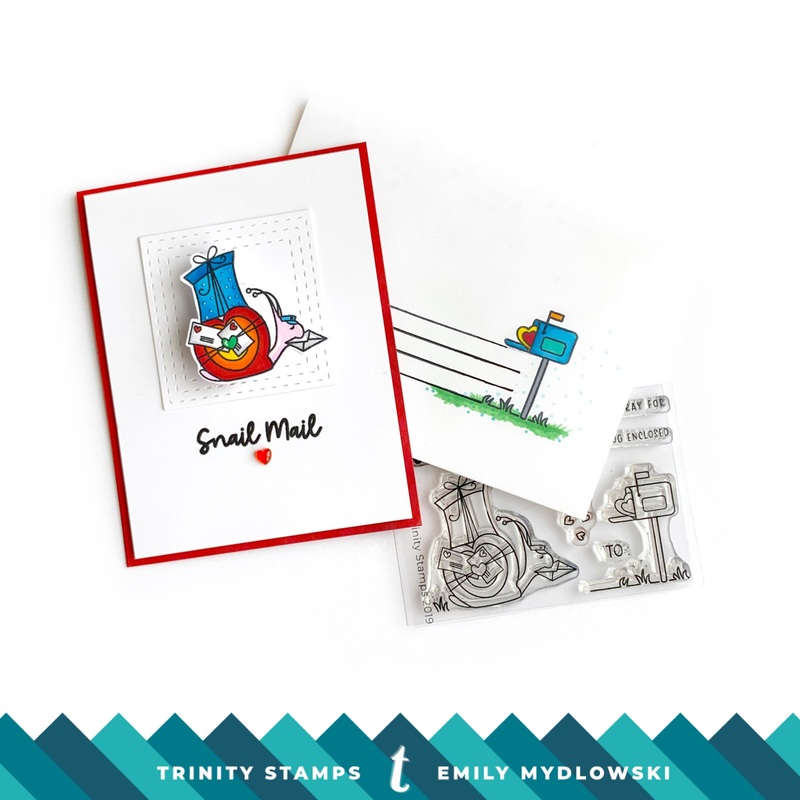 I’m on the Trinity Stamps blog with my One Stamp, Three Ways post. This week I have three fun celebration cards using the Decorate-A-Cake Stamp Set. Please stop by the Trinity Stamps blog for all the details. Hope to see you there!! Hi Friends! I’m up on the Trinity Stamps blog with this fun card! I mixed and matched a holiday stamp set with the amazing and beautiful Hello Sweet Friend Stamp set. I hope you can join me there for all the details. Hi Friends and Happy Monday. I’m up on the Trinity Stamps blog using the Mr. Snailman set to create three different designs with one stamp. This week, I created a card, decorated envelope and liner in celebration of the Snail Mail! I hope you can join me to see all the details. Mr. Snailman is also a wobbler!! Hello Friends! Welcome to the WOW! 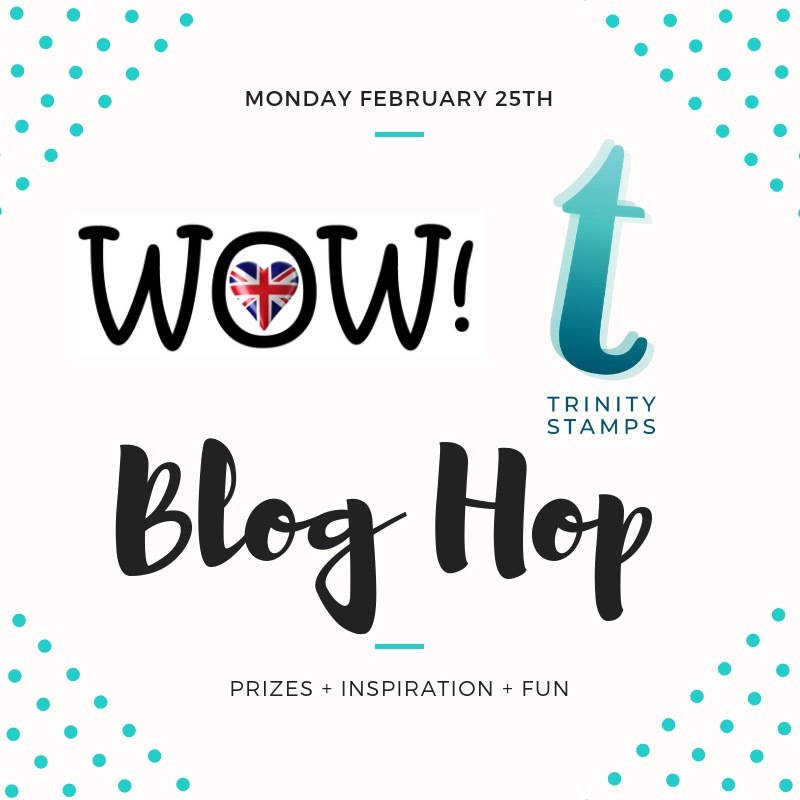 Embossing Powder and Trinity Stamps Collaboration Blog Hop. I’m so excited to be sharing a couple cards with you during this fun collaboration hop. I hope you are having a great time seeing all the beautiful creations from the entire hop and thank you for stopping by to take a look at what I’ve created. Since this is a Collaboration Hop, we also have some fun giveaways! We have two prize packages to giveaway and all you have to do is leave comments here and along the hop for a chance to win. Check out the bottom of the post for prize package details and the entire blog hop line up! With the cold weather, I’ve been craving Spring and when I crave Spring I tend to start creating with pastels (especially pink) and floral designs. The Opaque Pastel Pink is a wonderful color and what I really enjoy about the WOW! Embossing Opaque colors is that they look totally different when applied to white card stock vs. a color card stock. With this embossing magic in mind, I decided to create the same Thank You Card Design but different color card stock. The number one most important step: Apply a Static-free powder to your card panels. I then stamped the floral image from Hello Sweet Friend several times on the white and pink card stock panels. Then I added the Opaque Pastel Pink Embossing Powder and applied heat to emboss the images on the card stock. Then in the extra spaces between the floral designs I stamped the greenery images. Then I heat embossed the images in Metallic Gold Rich Regular Embossing Powder. For a little extra dimension, I added in some Prismacolor pinks to the rose images. To create the gold embossed square behind the sentiment block, I took the WOW Embossing Pad and smooshed it all around two white card stock squares. Then I heat embossed the gold to the card stock. I stamped Thank You from Hello Sweet Friend with the Embossing Pad and heat embossed with more Metallic Gold. I layered the gold embossed square and sentiment square together with thin foam dots. Adhered the Embossed panels to a white and pink card stock base and then adhered the sentiment to top/center of the embossed patterned background panel with thin foam dots. I hope you enjoyed how these two PINK and GOLD cards came together and are inspired to use your embossing powder and Trinity Stamps in new ways. arch 6th 2019 on both Trinity Stamps & WOW! Embossing Blog. Make sure you hop along and see all the other amazing cards. Don’t forget to leave comments throughout the hop for a chance to win! All my designs are created with products that I love to use. I do use affiliate links to receive a small commission (at no additional cost to you) when you click on links and make a purchase from my blog. I greatly appreciate your support!